Platillo Moros (or simply moros, moro, congri, or arroz moro) is the famous dish of Cuba, their version of the rice and beans combination found throughout the Caribbean and in Brazil. 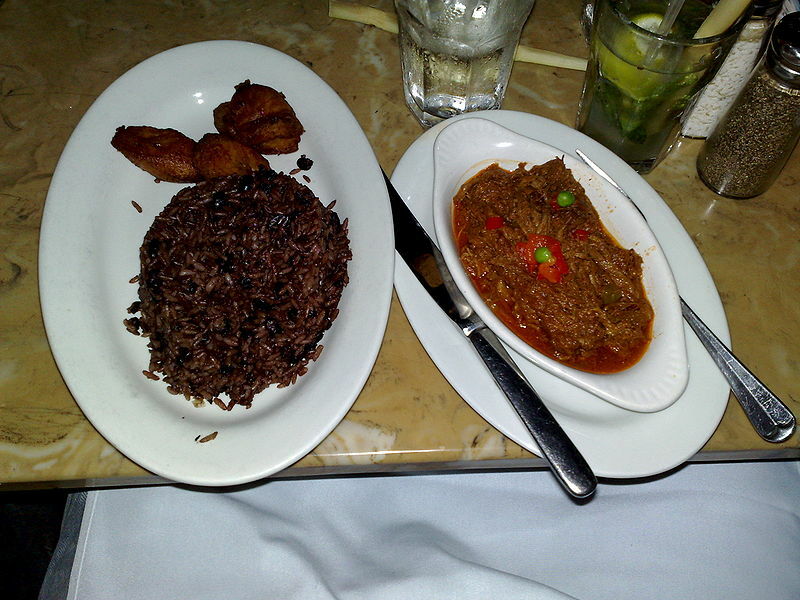 Left: A Cuban dinner: Arroz Moros with maduros on the left, and ropa vieja on the right. Rice and bean dishes are also found throughout the entire Caribbean and expatriate communities of all of these cultures. "Moros" translates to English as "Moors and Christians". The "Moors" refer to the black beans, and "Christians" to the white rice - a reference to the early settlers of Cuba for whom the Reconquista of Spain was a recent memory. The cooking of moros generally involves cooking black beans in a good amount of water, and then cooking the rice in some of the water (soup) of the beans in another dish. The rice may also be cooked separately with beans simply served alongside or on top of the rice, although this is not the dish moros y cristianos. Onions, garlic, bell pepper, oregano and bay (laurel) leaf are common flavorings for this dish, generally cooked as a sofrito (a base for beans) beforehand.